A new minor version of IrcLogger, 1.16c is out. New option cachepages=on to cache individual pages for each day. Default is still only to cache the listings of all pages in a channel. This option may be set in the irclogger.conf file in the installation directory, as for the other options. At last, I found the motivation to work again on this site that I have left dormant since 2009. And I start with a long deserved migration of the engine from the old TWiki system to the superb Foswiki WIki engine. 3 ok, I filled the fields, and hit the OK button... and it just reset the page to empty fields! 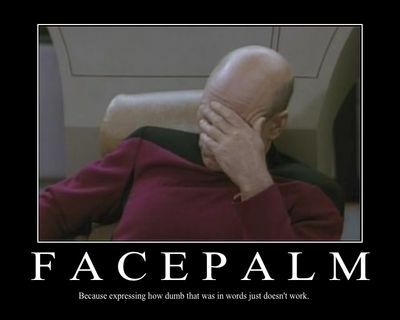 Grumbling, I re-typed the fields, re-clic, and... another blank page! After these two more failures, I tried to think (which is what you http://en.wikipedia.org/wiki/Don't_Make_Me_Think do not want your users to do, trust me!). I then read the button label and discovered that this big, prominent button alone at the bottom of the page was not the Submit button but the Cancel one!. I should have hit the middle one "Valider", but this button was not in the correct place on the flow of the form. So,after 3 failed attempts, I managed to pay my bill. 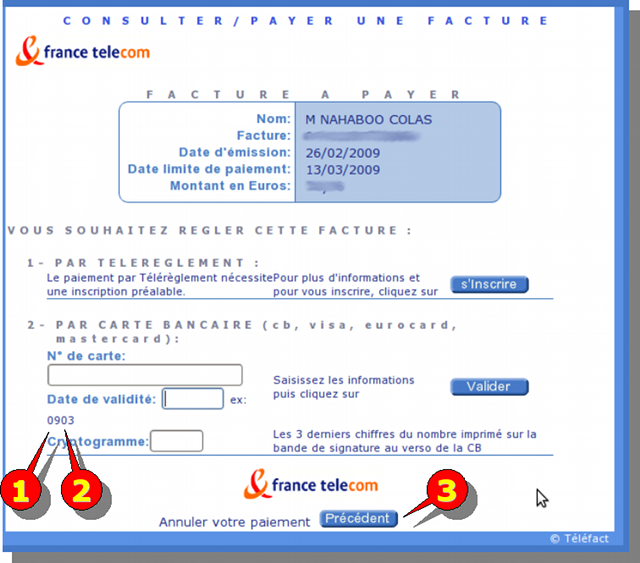 All this on a simple form with no fancy verification code or Captcha. Well done Telefact, I wonder if you can find a worse example still in use today. As most of you must know by now, Google http://googleblog.blogspot.com/2009/01/this-site-may-harm-your-computer-on.html suffered an outage on Jan 31, 2009 that was caused by a simple mistake: the search Goliath depended for its results on a small http://stopbadware.org/ David but didnt properly prepared themselves for the risk of such a dependency on a 3rd-party site. Unbelievably, when the http://stopbadware.com stopbadware site failed to respond (ironically, because a Google bug was DOS-ing them), they decided to... stop serving pages! A saner approach would have been to serve anyways, or perhaps better, reuse a cache of the stopbadware previous results. It also brought me memories of a similar blunder I was responsible for at work. I set up a monitoring daemon to check that our vital http://www-sop.inria.fr/acacia/WORKSHOPS/IntraWebs2006/Chat_Intrawebs2006.pdf Intranet Wiki was up. The daemon checked various server health issues, and would eventually restart apache if it could find any other solution. One day, somebody by mistake locked the front page of the wiki so that nobody could see it... and the daemon, unable to see the page, would then endlessly restart apache... The resulting behavior puzzled me quite some time, especially since nobody uses a Wiki front page (everybody dwells in his own little corner) so the main cause was not found immediately... I can see the same human logic here in this bug: we are very bad at expecting the unexpected. Scansreader is a small, fast and efficient linux comics book reader written in C. I have now migrated its home page on this site, from its legacy place. The rise of the Foswiki: behold Foswiki 1.0.0 ! Today, we celebrate the first release of Foswiki. It is quite exhilarating, as since the TWiki community was kicked out brutally by the founder Peter Thoeny in Oct 2008, it has been an hectic ride to get this release out of the door. I must say that this experience has been quite enlightening for me, I couldn't believe my eyes on how a depressed, bitter community has totally refounded itself and is now more healthy than ever, with a joyous democratic and innovative energy. On the other hand, it was hilarious to see Peter Thoeny, left alone in his now deserted "community" of ... himself plus one employee, trying to pretend everything was normal and having formal weekly meetings by themselves, like a modern Robinson Crusoe and Friday on their deserted island... Or his pathetic attemps to hide to users the existence of foswiki. PS: also great is the http://fosiki.com/Foswiki_debian/ Foswiki debian repository maintained by Sven Dovedoit automatically. This is the kind of hacks I really like doing: examining a problem and try to find a simple solution by reasoning by analogy with the real world. This time, it was how to help developers of foswiki to keep track of changes in twiki. The metaphor chosen was the GTD (Getting Things Done) method, with a simplistic RSS + script technology. See more in the FoswikiRssFeedToTasks article! Well, it has finally happened, the dual-faced Janus what makes both the beauty of Open Source projects, and its Dark side, have come to visit the http://twiki.org twiki Project. 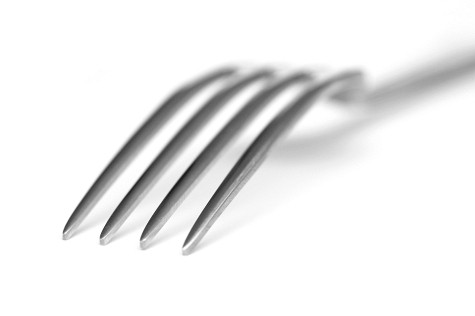 The http://en.wikipedia.org/wiki/Forked Fork is here! Strangely this time, it is the project founder, Peter Thoeny who "forked out" most of the active developers of the Open Source project by locking them out of the project. Ironically he seemed to have so much dreared a fork that he finally decided to provoke a "preeemptive fork" to clear things out, and reach an often seen configuration where a private company sells a product based on an Open Source offering, with a community knowingly contributing to enhance a product belonging to a single company, but getting a better product in return. 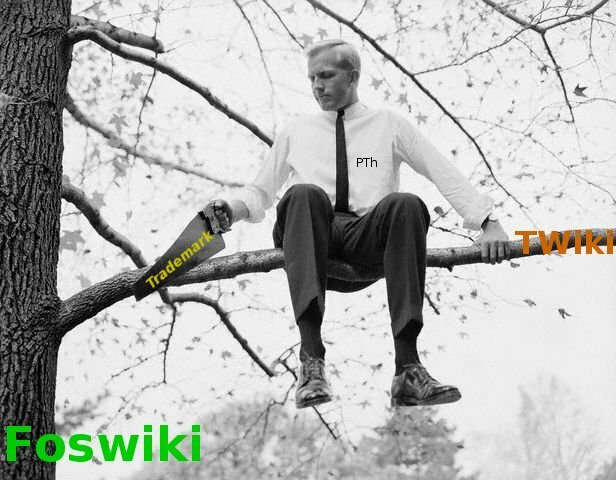 This is not a bad situation in itself, for wikis it is already the case with http://xwiki.com xwiki and http://wiki.mindtouch.com/ deki, the problems came in TWiki case as the company came very late in the picture, and could be seen as "highjacking" the TWiki built by the community. We will see what happens, but I would like you to read the excellent article made nearly a decade ago, http://linuxmafia.com/faq/Licensing_and_Law/forking.html WHY LINUX WON'T FORK - And why being able to fork is still A Good Thing. If all goes well, it will end up in more technical directions explored, each project incorporating the good ideas of the other one. If not, the crisis will show the bad side of many people, and will discourage contributors watching from the outside 2 communities dying from the lack of a critical mass. As I was asked to take sides, I chose the "fork" camp, as I feel that it is where lies the heart of the community that actually made the modern TWiki. We will see how it evolves, but the beauty of open source is that both projects will be able to use the advances of the other one - if one do not end a proprietary fork. May we live in interesting times! As of 18 Nov 2008, the community we decided on the new name: Foswiki - Free and Open Source Wiki. This was chosen after a vote process to chose a name with com/net/org domain names available, and not infringing on a trademark in both US and Europe (this is why we couldn't keep the temporary name nextwiki, as it was a registered trademark of NextEngine, Inc).